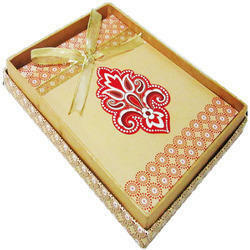 Being a leading firm in this industry, we are deeply engaged in offering a high-quality range of Wedding Guest Book. Our customised guestbooks capture the unique spirit of your personality and performance. Available in 3 alluring options of silver, gold and platinum, each is a testament to your efforts, class, grace and performance. From special textured media to sophisticated designs, we embrace them all to give you the ultimate memory of your red carpet moment. A very important item that will have all your blessings that you would have received on your wedding day . Store it with as a life time remembrance. If at all you want to keep the memories of your attendees of your wedding, we can provide some of the best, creative and easiest ways to get it done. Our organization caters to a wide market for an assortment of Guest Register Book. All our products are developed in tandem with industrial quality norms, employing advanced machines. Having appropriate categorization, these Guest Register Books are extensively used by various enterprises to keep record of essential data.